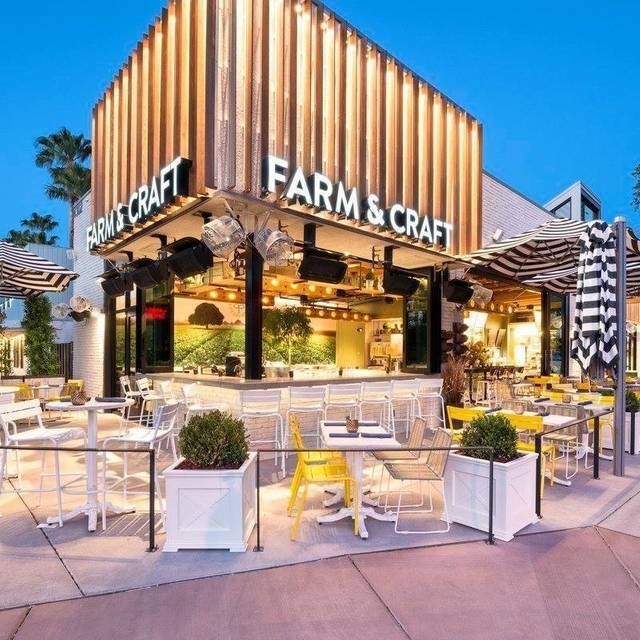 You must make reservations at least 5 minutes in advance of the time at Farm and Craft Scottsdale. We have ample street parking along with a 3 story parking garage just a few hundred feet south of our location. There is also a Valet just across the street from us. You can see the stand from our front door. The Scottsdale Trolley drops off just one block south of us on Mill and 5th ave.
We have a curated playlist of funk, soul, top 40, and much more to take the ambiance a perfect balance of amazing music without being intrusive. Fridays & Saturdays at 7pm we have top local Djs spinning lounge, house, top 40, throwbacks, and everything in between. The energy is just right for a great night out with friends while enjoying a full service dining experience. We also have a Dj on Sundays for Brunch. Our sunshine vibes and feel good music are the perfect accompaniment to our craft mimosas. Organic, gluten-free and health-conscious fare is what it"s about at this Scottsdale New American offering everything from protein pancakes to flax-seed flatbreads for breakfast, lunch and dinner, plus wine, beer and cocktails made with fresh juice. The chic, easygoing interior features light wood accents, communal seating and a bright patio. Caleb was an excellent waiter - very nice and charismatic. Our food was delicious, drinks were good. There was a bit of a mixup with food delivery, but it didn’t negatively affect us. It was a busy night! The only disappointing dish was the cauliflower cheddar mash, it was grainy and seemed lacking in cheesy flavor. There are better options in Scottsdale for this price point and menu. It was just ok. Service was a bit off. I thought the food was really just ok. I had the kale salad with salmon. The salmon was actually very good but there was literally no dressing on the kale. Service was a bit slow. Overall just average. Nothing amazing. Not awful. Great atmosphere with great healthy food options. The food came out mildly warm and the service wasn’t up to par as our other visits have been. The service was slower than normal but they were really busy. Acoustics not too good. Loud and hard to hear. Good food choices for anyone. Waiter was nice and food was good. Didn't care for this on. Will not be going back. The food is likely Healthy, as advertised, but we can't say it was tasty. If you want healthy and tasty, go to True Foods Kitchen. The food is excellent! The staff was very attentive. And the decor is adorable! After being seated, I waited for 20 minutes and nobody said a single word. Multiple employees were standing around, and I tried to make eye contact to order a drink to no avail. Finally we walked out of the restaurant to go somewhere that values their customers. I have never left a negative review for a restaurant, but felt so terrible after this experience I felt compelled. Farm and Craft was ok. Just ok. The food was ok, the service was not great. It was nice to sit out on the patio however. Everything tasted fresh! Drinks and food were good, except for the BBQ Chicken Flatbread. It did not have enough flavor for my taste. The lasagne was excellent and the roasted chicken and spinach artichoke dip were good! We had a really nice first visit to Farm and Craft in Scottsdale. We had a reservation. They had the table ready. We had dinner with friends that are Vegan. We eat healthy but are not vegetarian or vegan. All of us thought that the menu options were great. We had a nice seat outside. The weather was great! We decided not to go with appetizers, just main courses. We all were happy with our order. I went with the Rustic Farm Salmon Bowl. It was really good! My server, Emily, was excellent. She made sure my meal was gluten free and she has an outstanding knowledge of wines (she is a certified sommelier). The food was very good, the atmosphere was relaxed, and it was good value. There were a lot of servers around, but a bit unclear about who was doing what. I found the coffee a bit too strong and not hot enough. 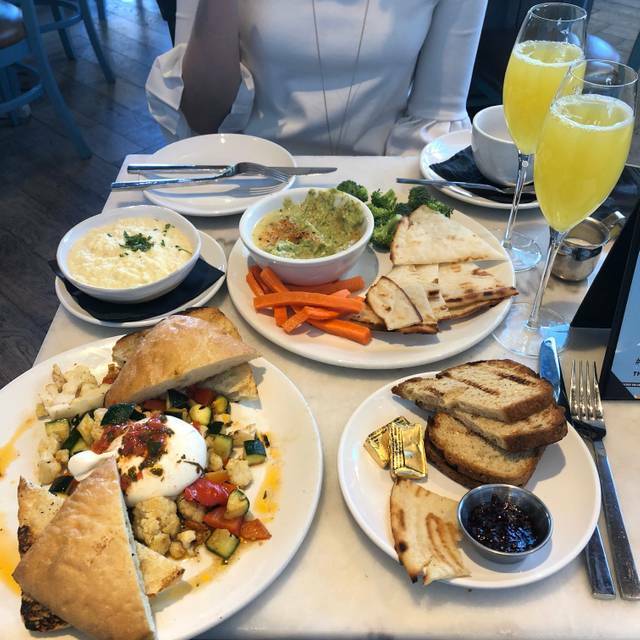 I had the blueberry protein pancakes and my friend had the smoked salmon, we both loved our meals. Amazing place. Great drinks and unique, healthy food. Love Farm & Craft. The food is great and they have some interesting cocktails. Came for brunch with a party of 9. We were seated right away and had some amazing drinks to start. Highly recommend the watermelon drinks. The food was so fresh and excellent. I had the protons toast and my daughter had the smoked salmon toast. Excellent. Service was excellent and very friendly. The cheesecake single handedly made our valentine’s day great. Food and service were mediocre. I had wanted to try this restaurant for some time now. I was not impressed. I’m glad I tried this restaurant, but there is something....lacking. I reserved a table for 4 well in advance, but we were right next to the soda/ice machine. Disappointing. The food stopped just short of being great. My steak was on the cold side and a bit tough. Does this place have potential? Heck yes! Can’t wait to go back. The food was amazing!!!! We were in a party of 6 for brunch on a Sunday. We each ordered a different meal and we were all pleased with what we got! Small restaurant that hits with a big bang. We went for dinner. I think most people in the reviews went for lunch or brunch but we loved it for dinner. The menu was awesome. Lots of gluten free offerings as well as vegetarian and other dietary considerations. The kombucha cocktails were so good!!! I shared two dishes with my friend, the strip steak and the salmon poke bowl, and both were amazing. Really cool spin on food that tastes great! Great breakfast! Wonderful vegan options. Didn’t like the coffee. Fanatastic service!! Great spot, great energy, just wish the music at 11AM was not as loud. Felt like I was at a club at 11AM in the morning. Had the vegan flatbread and it was delicious. Also had the organic red blend wine (on tap) which I enjoyed very much. It was smooth and refreshing. Food was amazing! I have a gluten intolerance & this restaurant had so many gluten free options. Great healthy food choices, well prepared, & tasty. Cold tea. Slow service but great food. Wait staff was inattentive, forgetful, and not very knowledgeable. Food was horrible. Chicken was dry. Flank steak was barely edible. Over priced, loud and dark... nothing was enjoyable.